The fabled Google Barge got dismantled and sold. The Dream Is Dead. Google Sold Its Barge. 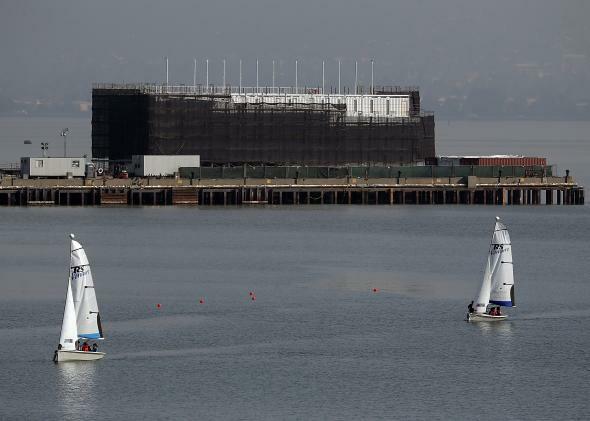 The Google barge photographed in happier days (October, 2013). The tech industry is all about dreams—at least that’s what Silicon Valley marketing would have you believe. But rarely does raw imagination and unbridled excitement play into a smartphone purchase. The Google barge was different. It was tantalizing, mysterious, and full of potential. And we were all happy it existed. But now it doesn’t, so happy Friday. Hope is gone from the world. The barge was really two barges, one in San Francisco and one in Portland. Rumors about them reached fever pitch in November, and finally a Google spokesperson told TechCrunch, “We’re exploring using the barge as an interactive space where people can learn about new technology.” The plan was to turn containers on the barges into attractive structures. The New York Daily News even published renders. But in March, the Los Angeles Times reported that the San Francisco barge got kicked out of the Bay and was relocating to Stockton, California, while Google did construction on it and acquired permits. And now the Portland Press Herald is reporting that the Google barge kept there has been sold to an “international barging company,” and that the containers on the barge will be scrapped. The barge in Stockton is still hanging around, and apparently its dock fees are paid through October, but it’s hard to hold out hope when the glory days of the barge seem so clearly behind us. Comfort one another in this moment of sorrow and try to stay strong.